Astronomers using the Hubble Space Telescope have measured the rotation rate of an extreme exoplanet 2M1207b by observing the varied brightness in its atmosphere. This is the first measurement of the rotation of a massive exoplanet using direct imaging. Little by little we’re coming to know at least some of the 2,085 exoplanets discovered to date more intimately despite their great distances and proximity to the blinding light of their host stars. 2M1207b is about four times more massive than Jupiter and dubbed a “super-Jupiter”. 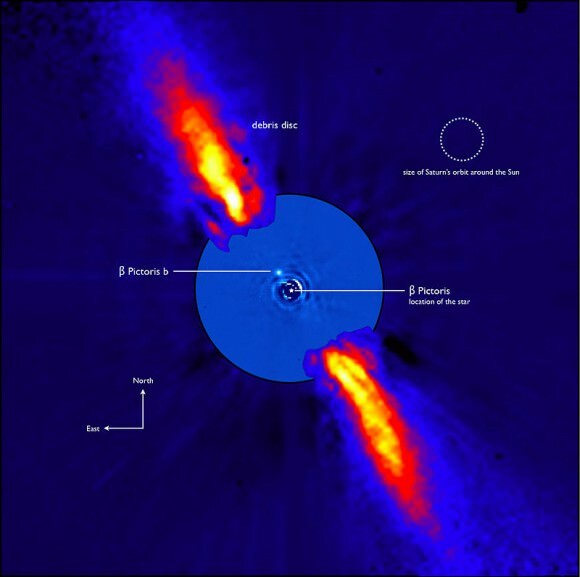 Super-Jupiters fill the gap between Jupiter-mass planets and brown dwarf stars. They can be up to 80 times more massive than Jupiter yet remain nearly the same size as that planet because gravity compresses the material into an ever denser, more compact sphere. 2M1207b lies 170 light years from Earth and orbits a brown dwarf at a distance of 5 billion miles. By contrast, Jupiter is approximately 500 million miles from the sun. You’ll often hear brown dwarfs described as “failed stars” because they’re not massive enough for hydrogen fusion to fire up in their cores the way it does in our sun and all the rest of the main sequence stars. Researchers used Hubble’s exquisite resolution to precisely measure the planet’s brightness changes as it spins and nailed the rotation rate at 10 hours, virtually identical to Jupiter’s. While it’s fascinating to know a planet’s spin, there’s more to this extraordinary exoplanet. Hubble data confirmed the rotation but also showed the presence of patchy, “colorless” (white presumably) cloud layers. While perhaps ordinary in appearance, the composition of the clouds is anything but. The planet appears bright in infrared light because it’s young (about 10 million years old) and still contracting, releasing gravitational potential energy that heats it from the inside out. All that extra heat makes 2M1207b’s atmosphere hot enough to form “rain” clouds made of vaporized rock. The rock cools down to form tiny particles with sizes similar to those in cigarette smoke. Deeper into the atmosphere, iron droplets are forming and falling like rain, eventually evaporating as they enter the lower levels of the atmosphere. “So at higher altitudes it rains glass, and at lower altitudes it rains iron,” said Yifan Zhou of the University of Arizona, lead author on the research paper in a recent Astrophysical Journal. “The atmospheric temperatures are between about 2,200 to 2,600 degrees Fahrenheit.” Every day’s a scorcher on 2M1207b. Both Jupiter and Saturn also emit more heat than they receive from the sun because they too are still contracting despite being 450 times older. The bigger you are, the slower you chill. All the planets in our Solar System possess only a fraction of the mass of the Sun. Even mighty Jove is a thousand times less massive. But Mr. Super-Jupiter’s a heavyweight compared to its brown dwarf host, being just 5-7 times less massive. While Jupiter and the rest of the planets formed by the accretion of dust and rocks within a clumpy disk of material surrounding the early Sun, it’s thought 2M1207b and its companion may have formed throughout the gravitational collapse of a pair of separate disks. This super-Jupiter will an ideal target for the James Webb Space Telescope, a space observatory optimized for the infrared scheduled to launch in 2018. With its much larger mirror — 21-feet (6.5-meters) — Webb will help astronomers better determine the exoplanet’s atmospheric composition and created more detailed maps from brightness changes. Teasing out the details of 2M1207b’s atmosphere and rotation introduces us to a most alien world the likes of which never evolved in our own Solar System. I feel like I’m aboard the Starship Enterprise visiting far-flung worlds. Only this is better. It’s real. Our stellar neighborhood just got a little busier … and a little colder. A brown dwarf that’s as frosty as the Earth’s North Pole has been discovered lurking incredibly close to our Solar System. Astronomer Keven Luhman from Pennsylvania State University used NASA’s Wide-field Infrared Survey Explorer (WISE) and the Spitzer Space Telescope to pinpoint the object’s temperature and distance. This is the coldest brown dwarf found so far, and it’s a mere 7.2 light-years away, making it the seventh closest star-like object to the Sun. “It is very exciting to discover a new neighbor of our Solar System that is so close,” said Luhman in a press release. Brown dwarfs emerge when clouds of gas and dust collapse. But unlike stars, they never grow dense enough or burn hot enough to ignite nuclear fusion in their cores. They live their lives less massive than stars, but more massive than gas giants. So they burn hot at first, then cool over time. And this newly discovered brown dwarf is as cold as ice. Literally. WISE surveyed the entire sky twice in its short 14-month lifetime, looking at cooler objects, which radiate in infrared light (but often remain invisible in visible light). It saw cold asteroids, dust clouds, proto-planetary disks, distant galaxies and hundreds of brown dwarfs. But one of these objects — dubbed WISE J085510.83-071442.5 — was moving rapidly, suggesting it was extremely close to the Solar System. All stars orbit around the Milky Way, with apparent motions seen on the timescale of hundreds of years. Stars close to the Sun, however, can be seen to make the slightest of movements on the timescale of just a few years. This object appeared to move in just a few months. After first spotting this wacky object in the WISE data, Luhman analyzed additional images taken with the Spitzer Space Telescope and the Gemini South Pole Telescope in Chile. The combined detections taken from different positions around the Sun enabled the measurement of the objects parallax — the apparent position of the object against a background set of stars as seen along multiple lines of sight — allowing Luhman to determine the objects distance. Spitzer’s additional observations helped pin down the objects chilly temperature, which can be determined based on how much light it gives off in different colors. Like a flame, the hottest part is blue, while the coldest part is red. Luhman found the brown dwarfs temperature to be between –54° and 9° Fahrenheit (–48° to –13° Celsius). 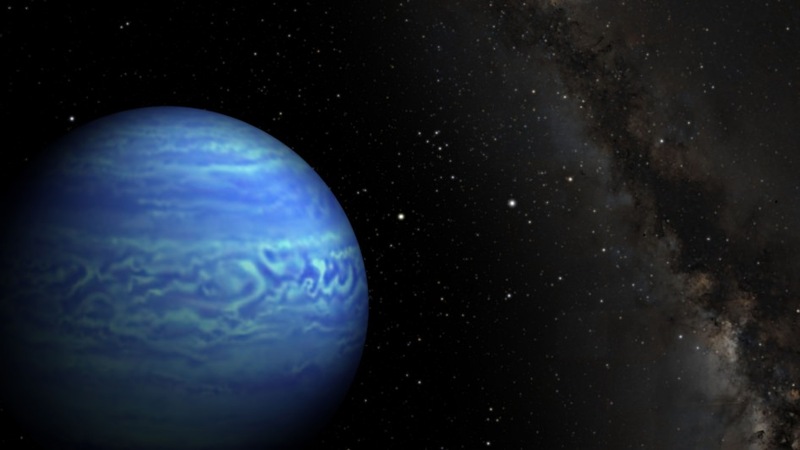 Previous record-holders for the coldest brown dwarfs were about room temperature. With a stretch of the imagination and advanced technology, it’s possible that other cooler objects, be them brown dwarfs of even rogue exoplanets, are yet closer to the Sun. The paper will be published in the Astrophysics Journal and is available for download here.